Peru's Congress President Daniel Salaverry speaks to the media after Peru's President Martin Vizcarra asked the Congress for a new vote of confidence in his Cabinet in Lima, Peru, Sept. 17, 2018. Peruvian opposition lawmakers on Monday criticized as unconstitutional a call by President Martin Vizcarra to hold a vote of confidence over his proposed anti-graft reforms, a high-stakes move that could force out the Cabinet and Congress. Late on Sunday, centrist Vizcarra declared four anti-graft bills he has proposed a matter of confidence in his Cabinet, summoning a debate in Congress on Wednesday. If the opposition-controlled Congress delivers a vote of no confidence, Vizcarra would have to replace his entire Cabinet. But because the current Congress has already dismissed one Cabinet in this government, the constitution allows him to respond by dissolving Congress and calling new legislative elections. The escalation in tensions between Congress and the presidency is ushering in a new period of uncertainty in Peru, the world's second-biggest copper producer that has a stable economy but has suffered a rocky year of political instability. Vizcarra's move was condemned by Popular Force, the conservative party with a majority in Congress. "It has errors and interpretations with unconstitutional undertones in both form and content," Congresswoman Ursula Letona, a spokeswoman for Popular Force, said at a news conference, without giving specifics. Popular Force lawmaker Daniel Salaverry, the president of Congress, said that Vizcarra's call for a vote of confidence did not comply with "some characteristics in the constitutional framework." Osias Ramirez, another Popular Force lawmaker, accused Vizcarra of trying to stage a coup d'etat against the legislative branch. Vizcarra denied the move was authoritarian. "On the contrary, a motion of confidence is done with strict adherence to the constitution and that strengthens the democracy," Vizcarra told journalists on the sidelines of an event on Monday. The procedure could be vulnerable to different legal interpretations. Under Peru's constitution, which was passed in 1993 by former authoritarian president Alberto Fujimori, no president has yet summoned a vote of confidence with the potential closure of Congress on the line. 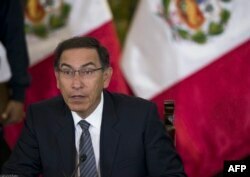 FILE - Peruvian President Martin Vizcarra gestures as he speaks, during a press conference with representatives of foreign media in Lima, June 5, 2018. Vizcarra proposed the anti-graft measures, which include new rules for selecting judges and prosecutors and stricter campaign financing laws, in late July following an influence-peddling scandal involving judges, lawmakers and businessmen. 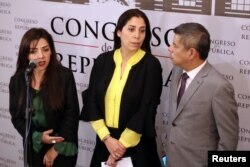 Salaverry said the reforms, which would require modifying the constitution, should not be rushed. The fresh political tensions come six months after former president Pedro Pablo Kuczynski resigned in a graft scandal on the eve of near-certain impeachment by Congress. It was unclear when the vote of confidence might be held. Salaverry said lawmakers would let Vizcarra's prime minister make his case on Wednesday but would start debate another day.